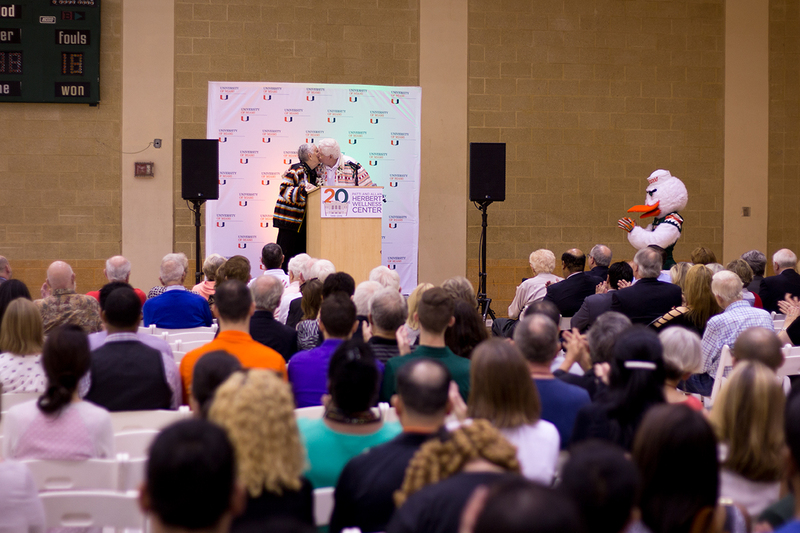 The Patti and Allan Herbert Wellness Center has been a centerpiece of both fitness and wellness at the University of Miami since it opened in 1996. Now, 20 years later, the Wellness Center still commits to Miami’s goal of a well-rounded education that emphasizes a balance between academics and lifestyle. On Tuesday, the Wellness Center held a 20th anniversary party with students, faculty and members of the community, including those whose names adorn the building’s entrance: Patti and Allan Herbert. Initially called the Student Wellness Center, the building’s name was changed after the Herberts donated $8 million to improve the center. The exercise and wellness facilities are a major draw for students, faculty, alumni and community members, garnering 13 million entries over the last 20 years, according to Executive Director Scott Levin. The Wellness Center today isn’t the same as it was 20 years ago. Gradual improvements to the facilities over the years, including an 18,000 square foot expansion in 2011, have echoed the evolution of the Coral Gables campus. He also emphasized that the original goal of the center was not only to provide a place for students to exercise but also to provide a center for overall wellness. Freshman Kevin Scott said that although he uses the facilities to play pick-up basketball and to work out, the Wellness Center also acts as a gathering place for Miami students. “Without the Wellness Center, I wouldn’t have met some people who I frequently hang out with,” Scott said. Many organizations find the Wellness Center to be an essential part of campus and a social hub at UM. It hosts more than 40 clubs and organizations, serving as a space for students to try things like yoga, water aerobics and cooking. “As a club sport based in the Wellness Center, we have access to a great number of services and facilities which makes operating as an organization much easier,” said Justin Ma, who runs the UM Table Tennis Club. The Wellness Center is also the largest student employer on campus, according to Levin. Landon Mediavilla, a freshman who works at the Wellness Center, said that the center is an engaging working environment for students. The Wellness Center is available for UM students who pay a fee and employees who purchase a monthly membership, but it’s open to more than just the UM community. A plethora of programs and activities are also offered to the general public. Correction, February 6: This story originally stated that the center is free for students and employees of UM.